I’ve been coveting one of those Nintendo Classic Super Nintendo Entertainment Systems, but I’ve had to tighten the proverbial belt with my first child on the way, and I have little to no time to play video games anyhow. So, last Saturday, I settled for a bottle of Moa Brewing Co.’s Bonus Mandarin IPA instead. I was attracted to it by its very cool, retro video game-esque label, which harkens back to the days of the SNES (though I was always a Sega kid) and the fact that I’m partial to both IPAs and mandarins in general— though I’ve never had a combination of them both at the same time! Blurb on the bottle: Bonus is a mandarin-infused IPA. Starting with a clean base, we added tonnes of mandarin peel and juice to boost the citrus zing. Featuring a heavy dose of Mandarina hop to drive home a fruit aromatic finish. The brewery: Moa bills itself as “a small brewery from Marlborough, New Zealand”. Though I don’t have any figures handy, I suspect Moa is the largest craft beer marker in the country, so it’s not that small. Think orca, rather than blue whale (Lion and DB) or flounder (most NZ craft breweries). Regardless, I’ve reviewed – and enjoyed – a number of the brewery’s beers before, including Moa Southern Alps White IPA, Moa St Josephs Belgian Tripel, Moa Oak Aged Imperial Stout, and the special-edition Moa NZ Gold Ale. The review: Despite the name and blurb on the bottle, there’s a lot more going on in this hazy, golden-hued IPA than just mandarin juice. Though there’s obviously plenty of that—it’s got that unmistakeable fruity tang and aroma. 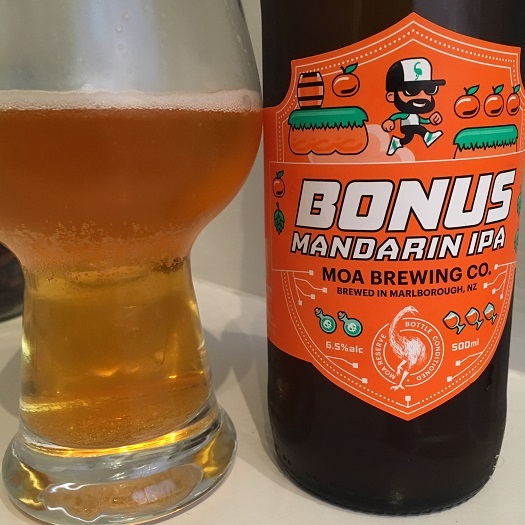 Moa’s Bonus Mandarin IPA is both sweet and sour, medium bodied, without the oily mouthfeel you often associate with other hop-forward beers around 6.5% ABV or more. It’s surprisingly complex, actually. The malt is not lost in the mandarin juice, and yet, at the end of the day, this beer is all about those dank, grassy hops, which have a nice bitter finish. The verdict: ‘Bonus’ is right. The addition of mandarin feels just like an added bonus on top of an already delicious tasting beer. Definitely check this beer out before it vanishes from shelves.